If you don’t care about 3D anymore—and even Nintendo’s interest in it seems to be fading—then the New Nintendo 2DS XL is the absolute best model in Nintendo’s line of portable gaming hardware. It’s a shame the company makes adding new devices such a burden. Nintendo’s nomenclature for handhelds has turned into alphabet soup, as if the company puts a bunch of adjectives and numerals into a hat, picks out three, and that’s the next hardware they make. The New 2DS XL is a successor to, among other things, the 3DS XL, the New 3DS and the 2DS, which were released in that order. Thankfully, the $149.99 New Nintendo 2DS XL itself is as svelte and sharp as its name is clunky and confusing. Some smart design decisions have made this much more than just another variation. The “New” part of the name means that this machine has the extra right analog nub, the two additional Z buttons, and built-in Amiibo support. It can play all Nintendo DS and 3DS titles, including the “New”-only ones like Xenoblade Chronicles, the upcoming Fire Emblem Warriors, and (most importantly) the Super NES Virtual Console games. Of course, it cannot play these games with stereoscopic 3D graphics, since its display is 2D only. This might be a deal-breaker for those 3D diehards, but even Nintendo’s mostly given up on 3D lately. Pokemon is 2D, this week’s Hey! Pikmin is 2D, Super Mario Maker is 2D. I’m not sure how much life the 3DS has left in it, but you may not need that 3D effect very much in the future. The removal of the 3D display has certainly kept down the cost of the device, compared to the $199.99 New Nintendo 3DS XL. It’s also let Nintendo reshuffle the system’s innards around, to great effect. The New 2DS XL is only a little bit lighter than the New 3DS XL—9.2 ounces versus 11.6 ounces. But when you’re holding them, it feels like a more pronounced difference. Why? Because all of the hardware that used to be in the upper part of the clamshell design has been shifted down into the lower half, or eliminated. In the 3DS XL, the top half is home not only to the 3D display, but the speakers, the front-facing cameras, the rear-facing cameras, and the volume knobs as well. In the new unit, anything that wasn’t eliminated was moved down into the half that you hold in your hands, leaving only the display on top, which is now very light and thin. When I play games on the 3DS XL, the top screen is constantly weighing down a little and tilting the whole device backwards. But the 2DS XL is stable when I hold it. It’s noticeably more comfortable. Another perk: You don’t have to unscrew the back of the system to swap SD cards. The cartridge slot and the micro SD card slot are gracefully hidden away under a flap on the bottom of the unit, right next to each other. There are tradeoffs. Of course there are tradeoffs. The most noticeable (if you’re not using headphones) is that the speakers are located on the bottom of the unit and point down and away from you, meaning you’ll perceive the sound as being much quieter. Loud in-game noises also cause the unit to vibrate a little bit in your hands. The case design, besides being comfortable, looks pretty nice— I like the matte finish and the ridged top with the small, diagonal Nintendo logo in the corner. The sky-blue accent color, I don’t know. It kind of makes the whole thing look a little cheap. Like a VTech toy for my toddler. I’d like to see a range of colors, but given Nintendo of America’s tendency to pick a single design and stick with it, I doubt we’ll see very many options. I mostly really like the 2DS XL, but now I have to explain why it won’t be my default 3DS device. Why it can’t. Nintendo released the DSi (and its downloadable game shop) in early 2009, which means that my New Nintendo 3DS XL is currently the sole home for nearly a decade’s worth of downloadable content. I’ve transferred those games from one Nintendo handheld to the next, bringing new downloadable games for newer models along the way. If it were made by any company other than Nintendo, I’d simply be able to log in to my account on the new device and download whatever games I like on the new system. Maybe I could have the same games on both devices! Or maybe I’d put 3D Classics Urban Champion on the 3DS, and EarthBound on the 2DS. Just like I might with games on my iPhone and an iPad. 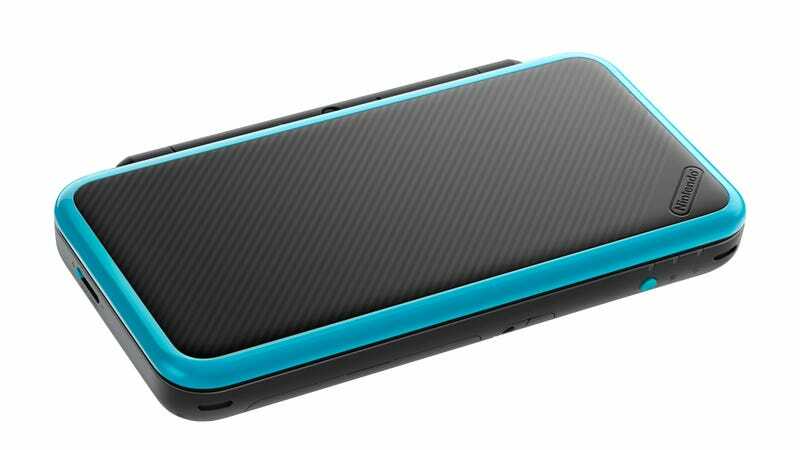 Maybe I’m an edge case, but I don’t know; I see a lot of Nintendo nerds buying multiple handheld variations. Nintendo’s current account system simply doesn’t support this. If I were to want to play my downloads on 2DS, I have to transfer everything including my account. Fortunately, since cartridge games aren’t tied to an account and since game save data is stored on the cartridge and not the console, I can still use 2DS XL to play cart games without messing with anything or having two accounts. As for you, if you really truly don’t want to ever use the 3D feature anymore—or if you’re upgrading from the cheapo 2DS model, or something—you may want to consider the 2DS XL as your main machine. It’s remarkably nice to play. I just wish adding new Nintendo hardware to the mix was an and proposition, not an or.